Ultimate 2004 Jeep Rubicon Raider - For Sale! This is a very unique opportunity for you to own an AWESOME Jeep Wrangler that is ready to take on anything you can throw at it. 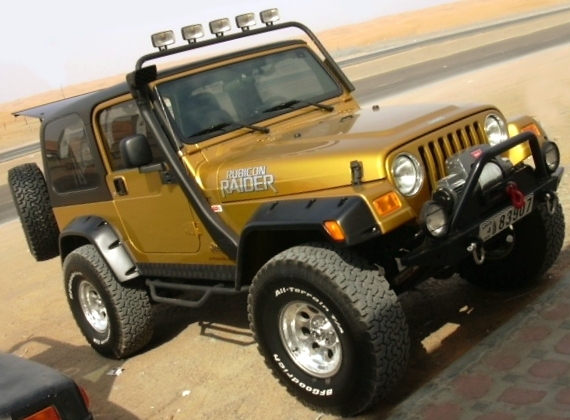 This is an almost new 2004 Jeep Wrangler Rubicon Raider in Dubai that is being sold to fund a new project. The owner's loss is your gain! The current owner then took this to the next level to create a truly awesome beast of a vehicle! On top of these dealer installed modifications, the current owner has added some of the very best modifications that money can buy. This vehicle is ready to do battle with the dunes and rocks and conquer them with ARB Selectable Lockers and 35" Tires. New Ring and Pinions with a ratio of 4.88 allow the Jeep to maintain the original performance with the massive tires, and a slow crawl speed with low range first gear. A Dana 60 ABS-ready rear axle is significantly stronger than the stock rear axle, and ensures reliability with the big tires. With a little extra work, you can add an Anti-lock Braking System to this vehicle! A Warn winch allows you to rescue those who can't follow! Some minor engine upgrades help it breathe easier but nothing is done to compromise the reliability of this vehicle. With Automatic transmission this is a great vehicle to drive every day, play in the dunes at low PSI, or even explore further into Wadi's and the Mountains without trying to press 3 pedals with 2 feet to crawl over rocks! With this vehicle you will have the ability to drive where others have to walk! or left on for a wider look and better stability. And still carries the warranty with the UAE dealer Al-Futtaim. The Wrangler is a 2004 Model and comes with the 4.0L 6 Cylinder Engine and the new 4-Speed Automatic Transmission. It has completed ONLY 9,700 KILOMETERS since new! To build this vehicle yourself by privately importing all the accessories would cost an absolute fortune and would be out of reach for many people. No expense has been spared on this vehicle. Arranging shipping of accessories from the United States is a headache few people want to deal with, and with this one-time opportunity, you don't have to! Here is a chance for you to get it COMPLETE and ready to run for an awesome price! Price: 11,000 Omani Rials ONO. If interested, Please contact Laurence Bridger today! PLEASE NOTE: This vehicle is located and registered in Dubai in the United Arab Emirates. The buyer will have to arrange transporting it here, as well as any Importation procedures. This vehicle is Gulf spec and before modification is identical to the ones sold in Oman.